I have been woefully negligent of my blog the last couple of weeks. It’s not that I haven’t been dying to chat and post, but May has been a very busy month for me. And then I had to go and be sick with a “touch” of the flu for about a week. It pretty much sapped all of my energy and ate up the small portion of my free time. 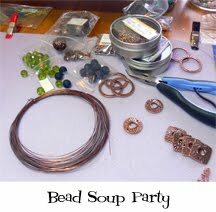 All that to say, the Bead Soup Blog Party is back for a second round!! I loved the first party, and am looking forward to creating for the second batch of soup. This party is hosted by the lovely and super-talented Lori Anderson. I love seeing all her new creations and the directions she explores as a designer and lover of all things beads. The way the party works is you sign up and Lori assigns you a partner. Then the you and your partner put together a stash of beads that includes a lovely focal, fun clasp, and assortment of complimentary beads. The focal and clasp must be used, but the beads are optional. Then you mail your selection to your partner and she sends hers off to you. You eagerly wait by the mailbox for a few days and a super fun beading package arrives. You have about a month to work on creating a piece with your soup ingredients. On June 19th, everyone in the party reveals what they made. And then the fun of hopping around to 97 different blogs begins. It is great fun to see what everyone makes. I’ll be posting what I sent to my partner in my next post. At least, that’s the plan.